Everyone out here will have a different experience with their own transformation. Mine is likely not typical; my body has always had the uncanny ability to adapt rather quickly to rigorous exercise. Conversely, I am sure others have adapted to the physical demands of the trail even faster. YMMV. Or 17. It was yesterday (day 18) that I realized my transformation was mostly complete as I walked 12 miles to Newfound Gap. A short milage day that ended in a Days Inn in Gatlinburg. 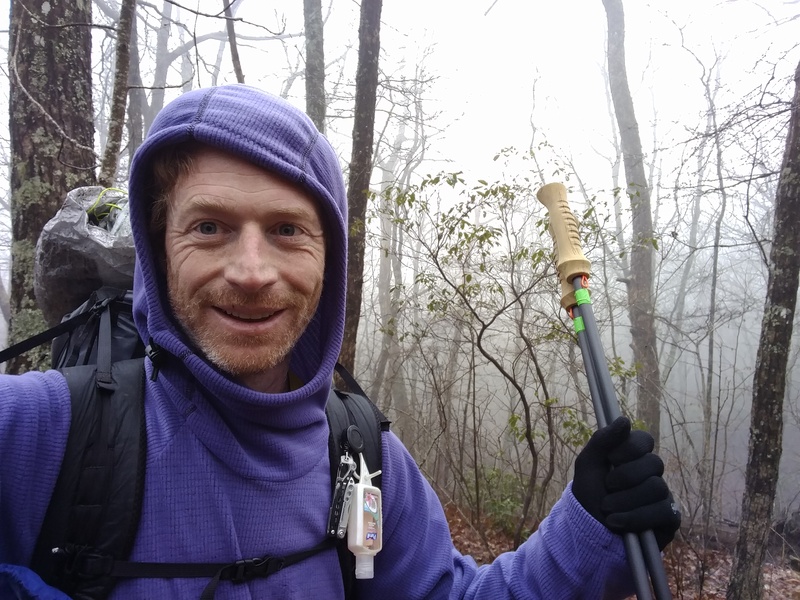 The day before (day 17) I had walked 23 miles to Siler Bald Shelter in the GSMNP. That was my 2nd 20+ mile day, and against all advice given at Outdoor 76 a week prior where me and my occasional hiking buddy, Scooby, were checking out some new gear. “Keep it to 10s for the next few weeks” was echoed by every employee there. And it was good advice. Just advice we choose to ignore. Not counting 3 zero days so far (4th one today, day 19, in Gatlinburg) I’ve averaged 13.8 miles per day, and that’s counting a 5 mile late start on Monday the 6th. I haven’t taken it very easy here at the beginning of the trail. Factoring in zeroes, I’ve walked 11.5 miles per day, much closer to the suggested average. Perhaps that’s where I find the balance for the bigger miles I’m starting to churn out. That’s what I keep telling myself. Zero days seem to be my motivation and reward for big miles. I dream of multiple hot showers and devouring a large pizza by myself as I put the trail behind me. It keeps me going. Knowing I will sleep in a bed that night, or the following, is all the motivation I need to keep moving. The first couple days the arch of my left foot was cramped and sore at night with a bit of pain while I walked. That was in addition to pain on the outside of my left knee, just below the kneecap. After Neel Gap the pain in my left foot disappeared along with the pain in my left knee, which was replaced by pain on the inside of my right knee, right next to the kneecap. The right knee continued to be sore for the next week. You could find me, along with many other hikers hobbling around the towns of Hiawassee and Franklin looking like broken humans. Kinesiology tape is an elastic sports tape that can be applied around strained areas to provide some relief and support for minor strains on different parts of the body. My Google-fu tells me that athletes seem to find some benefit to wearing the tape to reduce strain on areas giving them issues. For example, as part of a treatment for runners knee. It shouldn’t be used to treat actual injuries. I picked up some KT Tape in Franklin and Scooby and I got to taping our knees after watching some YouTube videos and reading the instructions. The following days, our hobble began to subside, by just enough to give us encouragement that this could be part of the solution to aid our overworked body parts. In Franklin, I picked up more tape. We both decided to tape both our knees, even though they were better off than days prior. It just seemed to help. By the time we were heading out of the NOC, we had convinced Old English (PCT Thru Hiker. Class of 2016) to try it on his ailing knee. He was unsure at first but decided it couldn’t hurt. When he caught up with me at Fontana Village a couple days later, he said it seemed to be working and was still wearing the tape. I had ordered to Pro KT tape off Amazon and had it waiting for me in Fontana Village. The “pro” stuff is a synthetic alternative that lasts longer, gives more support, and is more water resistant than the cotton variety you find at the outfitters along the trail. Before leaving Fontana Village on the afternoon of day 16, I was sitting in the lobby of the lodge waiting on deliveries from UPS and FedEx (replacement trekking pole from Gossamer Gear, and a fleece hoodie from Melanzana). I hear “my daughter likes your tattoos”. I explain that they aren’t tattoos, but elastic tape to aid my sore body parts. By now, I have the stuff on both knees, my left calf, right hip, and top of my right foot. The father was familiar with the tape from his triathlon experience, but we both got a kick out of them being called tattoos. Coming into Fontana Dam the day before, I had done a 17 mile day by 3pm and the top of my right foot started hurting. I was worried it could be a stress fracture to the bone/bones leading to my big toe, was hoping it was a bruise from lacing too tight, and didn’t realize that it was likely a similar issue that my knees had already worked out: sore ligaments. I set out that afternoon for a short 10 mile day across the damn dam and into the Smokies where I setup camp after a 5 mile climb. My foot was still hurting but again,the tape seemed to help. The next morning (day 17) I hiked 8.3 miles to Russell Field Shelter before stopping to have a second breakfast and get water. It was cold, foggy, and windy. Why the Smokies have their shelters on top of ridges and exposed to persistent winds escapes me, but I digress. That 20 minute break did me no favors. My right foot locked up as I set out of thar shelter. The next 2 miles were rough. I wondered if I had pushed my 39 year old body too hard. What if the kind folks at Outdoor 76 were right? Was I a fool for not heeding their good advice? Both my mother and sister are registered nurses, so I have a place to turn for minor injuries (and help finding Lyme disease meds ahead of time, just in case) and medical advice. I called Mom. I explained the condition of my foot as clearly as possible (where it hurt, what kind of pain, how long the pain had existed, the fact that it was a 7 out of 10 on a pain scale at the moment). She had me walk a couple different ways on it and describe the pain in each of those incidents. Her initial hunch after gathering this information was that I probably had some stressed or strained ligiments and it likely wasn’t a stress fracture, based on the fact that the pain was not consistently high, but only within a certain range of motion. She urged me to take Ibuprofen but I resisted since I don’t want to mask any pain; I need to listen to my body if I am pushing it to the very edge. I was about 11 miles into my 23 mile day when the sun came out. Somewhere just before Rocky Top. It had been foggy all morning, my gear was soaked from a thunderstorm the night before when I did a poor job pitching my Zpacks Duplex. I had my tent, sleeping bag, and wet clothes strapped to the outside of my pack, another Zpacks piece of gear, the Arc Blast. I stopped at a clearing just past Spence Field Shelter to lay out my items to dry. I did so reluctantly, because my foot felt slightly better than when I had spoken to my Mother, and I feared the stiffness would return. My gear dried but I was feeling down. I had wanted to catch up to Scooby but he started the day a bit over 5 miles ahead and was shooting for Solers Bald Shelter, about 23 miles from where my day started. My gear dried so I packed it up and I stepped back into the trail. Just ahead, I spotted a familiar face: Slumberland! We had zeroed and nearoed together in the last 2 towns and I didn’t know if I was ahead or behind him. I barely know the guy, but just seeing him lifted my spirits. I can’t say why, it just did. I told him as much and we both declared a desire to catch up to Scooby, who by now was nearly reaching the shelter 12 miles ahead of the 2 of us. Over the next couple miles, for reasons unknown, the pain in my foot dropped to a 1 out of 10. I stopped briefly at the very crowded Derrick Knob shelter to heat my Mountain House Lasagna before pushing onward. 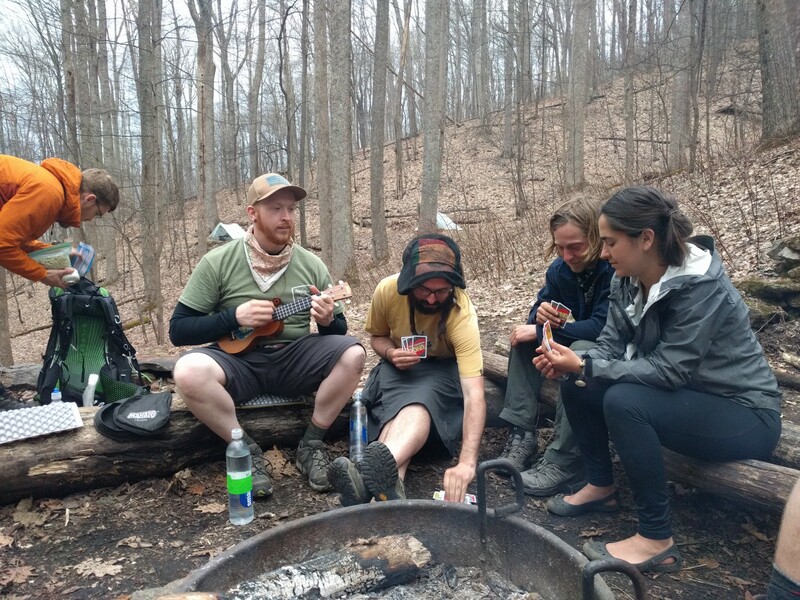 I ate as I walked, estimating 30 minutes of sunlight to spare by the time I would reach Silers Bald. I grunted and roared like a beast as I approached the shelter. Luckily I was far enough out that no one heard me. Those sounds were for me and nature alone. I had done it. 23 miles in a day. My painful, multiday foot ailment almost nascent at this point. I got a brief signal on my phone and a message from my Ma urging me to take Ibuprofen to reduce inflammation. I promised I would since my day was over so I popped 2 Advil and called it a night. 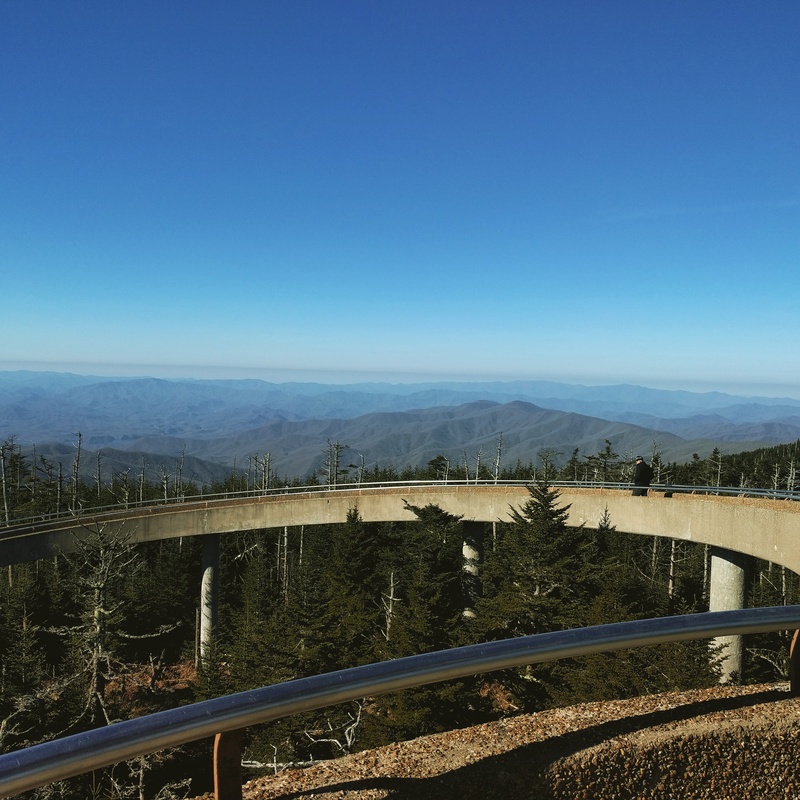 March 24th – A clear day on top of Clingmans Dome. And that brings us to the beginning of this blog post. My 12 mile day to Newfound Gap. After summiting Clingmans Dome, the last 7.7 miles seemed to take forever. My muscles were sore. I have a pesky knot in the middle left side of my back. I kept checking Guthooks AT Guide far to frquently for the information to be helpful. It only dragged things out despite a normal pace of just over 2 miles per hour. I had promised my body a zero on Friday and a bed on Thursday night. I day dreamed of devouring an entire pizza and 2 liters of Mellow Yellow. A getting a massage! AWOL’s 2017 Guide lists a Licensed Massage Therapist in Gatlinburg. The rewards for my efforts were only so many steps away. As I neared my destination for the day, 12 miles by 1:30pm, I realized I could skip town and keep going, from a physical standpoint. Sure, I was sore, but my body had finally adapted to the trail. The pain was all but gone in my foot, my knees and left calf felt good. But I promised my body a zero and it had held up on its end of the bargain. Plus, I had planned my food resupply poorly and had nothing left in my bag I wanted to eat, so I hitched 15 miles into Gatlinburg (thanks, Rachael!) and checked into the Days Inn for a rest I had more than earned. I know I have to continue to listen to my body, and that other issues with my body are likely to appear, but I broke through a wall on days 17 & 18 of my thru hike attempt. My body is a hiking machine. 15-20 mile days are pretty much standard for me from this point and will increase going forward. This pace will afford me the time to take some extra days off while I work my way up the trail, but still finish within 5 months. And boy-o-boy can I put down some food to fuel this machine. That’s a whole different blog post though. Gray Ghost! Thanks again for the trail magic. I eat so much in town and I am carrying a ton of good food on trail, too! Im at Standing Bear. Done with the smokies. Good luck on your PCT thru this year.